I just came across a couple of weeks old post from John Cochrane’s blog. Cochrane seems to be very upset about the calls for easier monetary policy in the euro zone. Let’s just say it as it is. Even though Cochrane is a professor at the University of Chicago he is certainly not a monetarist. It is sad how the University of Chicago has totally abandoned its proud monetarist traditions. Again you would think that Milton Friedman would be screaming from economist heaven about Cochrane’s odd references to the “tenuous” link between the price level and interest rates – as if interest rates are telling us much about monetary policy. Anyway, note that Cochrane says he likes a price level targeting regime. Fine with me. Then why not endorse Price Level Targeting for the euro zone professor Cochrane? 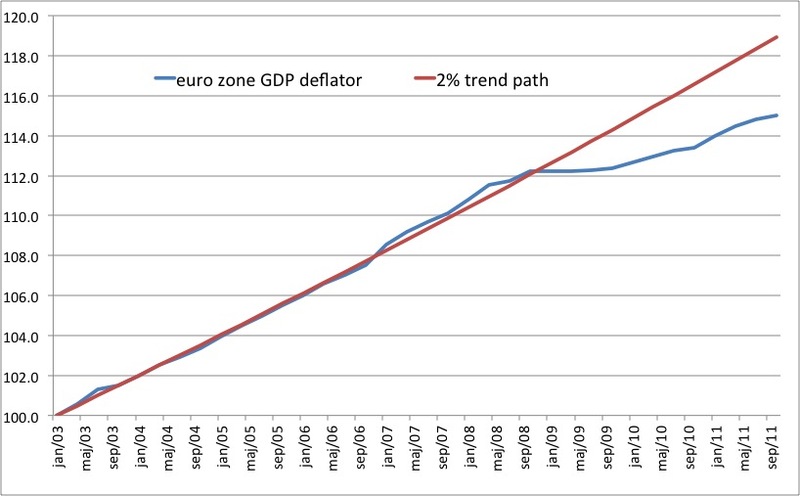 The graph below shows the euro zone GDP deflator and a 2% trend path for prices. The 2% path is of course what the ECB would be targeting if it implemented a Price Level Target as supported by Cochrane. Now have a look at the graph again and tell me what the ECB should do now if it was a Price Level Targeter? The graph is very clear: Monetary policy is far too tight in the euro zone and as a result the actual price level is far below the pre-crisis 2% path level. If Professor Cochrane was consistent in his views then he would obviously conclude that the ECB’s failed monetary policies are keeping the euro zone price level depressed, but I am afraid he did not even care to study the numbers. Cochrane should obviously be calling for massive monetary easing in the euro zone. Milton Friedman would do so. I can only again say how sad it is that the University of Chicago professors continue to disregard the economics of Milton Friedman. PS I hope I am wrong about the University of Chicago so I would be happy if my readers would be able to find just one staffer at UC that is actually a monetarist. Ok, I would be happy if you could just locate a student at UC who has read anything Milton Friedman had to say about monetary theory. PPS I really do not like this kind of attack on what other economists are writing on their blogs. However, as an admirer of Milton Friedman the continued indirect badmouthing of Friedmanite monetarism by the present day University of Chicago professors upsets me a great deal. See here on another University of Chicago professor who doesn’t care about Milton Friedman. Another post on why the ECB should target the GDP deflator rather than HICP. Cochrane does not seem to impress quite a range of other economists. Why might it be that there’s such a big discrepancy between the GDP deflator and the HICP (which Cochrane and the ECB are using)? George, I agree. Cochrane is certainly a good economist, but I strongly his view of this crisis and he has certainly not demonstrated any major insight to the monetary causes of this crisis. Friedman would be disapointed. From Cochrane’s above remarks, it appears that he does not believe money actually has the capacity to be neutral; even though – as Finegold pointed out, he has a better understanding than some Austerians who I believe would fish for prosperity with a cane pole (instead of the excellent rod and reel of NGDPLT central banks could actually use). It took me a while to understand what neutrality actually meant, and when I fend off arguments that central banks are not central planners (at least with NGDPLT), it’s not hard to see where some would get the idea that present day contraction is a bad example of non neutrality and central planning. Does he realize what he is advocating? I doubt Friedman would have agreed that inflicting monetary deflation on a people is a good way to get them to do what others think needs to be done. It’s also a bit problematic because the differences between current economic governance and the direction in which they are being pushed is only a few shades of gray. If it were not for the trade balance problem, Germany and France would be having close to identical problems and they cannot outrun the crisis forever. Sad to say, but politics and dogma is trumping economics now, in the right wing. How to explain that in 1984 Treasury Secy Regan, working for President Reagan called for moving Fed powers into the Treasury Department as the Fed was too tight? Inflation then was 4-5 percent, and the Wall Street Journal was calling on Volcker to ease up. The Friedmans, Taylors, Meltzers, Bernankes, Mishkins used to make trips to Japan and call for robust monetary expansion, especially Friedmans. Friedman has left the scene, and the others are mute or adversarial to what they used to preach. Now we have some sort of inflation-hysteria or phobia on the right wing, combined with a monetary asceticism and gold nuttisms and currency fetishes. We should suffer, even permanently, if it holds down inflation. At least while a left-winger is president. Cochrane’s dogmatic and pompous pettifogging about inflation and currency shows all the insight of backbencher in a Newport Beach, CA bar.